ICYMI: I had already seen “Under the Skin” in may, at this years /slash 1/2-Festival. It was my highlight of this short version of the /slash Filmfestival, and even a couple of months later it’s still up there with the best movies of the year (so far) for me. After reading the book (which, while nice, is nowhere near as fascinating and enthralling as the movie) and watching it in the cinema for a second time, I think I’m finally ready to try to give it its due. The day after I saw it in the cinema for a second time (with my /slash- and blogger-buddies Kalafudra and Maynard) I went to amazon.de and saw a lot of 1-star reviews… which urged me right away to buy the blu-ray, just out of protest. It’s the same with IMDB, by the way. You’ll find quite a few reviews where this movie is completely trashed. Some reviewers even claim it to be the worst movie that they’ve ever seen. Well, congratulations for their choice of movies in their lives so far. I mean, seriously, come on. So you didn’t like it, that’s fine. But why does everything always have to be the best or the worst thing ever? As much as I despise such hyperbole, I totally get the sentiment behind it, and understand where those people are coming from. “Under the Skin” is no slight movie fare, and it’s most definitely not for everyone. I, however, found it absolutely stunning. Despite the fact that I’ve seen it twice now, I’m still a little reluctant to talk about it in too much detail. “Under the Skin” is not simply a movie, it’s art… and like every piece of art it works a little bit like a mirror. What you see in it depends greatly with what you bring to it. “Under the Skin” is a movie where very little is plainly stated and/or explained. It’s also more about mood and invoking certain feelings than it is about plot. And it’s also full of symbolism. Thus, it’s a movie that exalts the imagination of the viewer, and opens itself up for interpretation. And I don’t really feel like forcing my thoughts unto you. But let me just say this: The way I see it, Scarlett Johanssons unnamed character, after being drawn into our world, slowly starts to find her humanity. Feel free to disagree. Without giving too much away, let me talk about a couple of scenes that really stuck with me. First: Those great sequences with the trap. I know that it will probably be too fucked up and weird for many, but I found those scenes to be visually stunning. Then there’s the moment where the baby’s crying at the shore, which gave me chills and really made me feel uncomfortable. And I also loved the scene where Scarlet Johanssons character stumbles and falls down – and that’s all I’m going to say about it. At first, you may think it’s funny, or you may not get why she’s doing what she’s doing, but I thought it was absolutely great, and made perfect sense. I also love the way the movie kinda put’s us in her position, being stuck in the van with her, listening to this human beings, and often don’t understanding a single word they’re saying (because of the heavy scottish accents). That was really clever. There are many more notable and memorable scenes, but since I would have to go into spoiler territory for them, let me just say that pretty much everything about the last 30 minutes or so was absolutely incredible. Visually, this movie offers many stunning sequences. Jonathan Glazer definitely has an eye for beautiful, haunting images. The score by Mica Levi is also absolutely perfect for the movie, and extremely important for it’s disquieting mood. Scarlet Johansson is also great in this. She really seems like an alien being. Her cold, distant stare, how she switches emotions on and off, her sometimes bewildered expressions… just perfect. The only thing that keeps me from giving this the highest score right away is that the beginning of the movie really is a little slow (many would argue that the whole movie is slow and pointless, but I couldn’t agree less). However, I do believe that it gets stronger and more intense with every passing minute, and the climax is incredibly thrilling. I love the way the movie ends, and found the last couple of images especially haunting. It’s a movie that will stay with me for a long time, and that I will revisit frequently. A stunning, mesmerizing piece of art that has to be seen – even if you end up hating it. This entry was posted in /slash, cinema 2014, movie reviews, new releases and tagged horror, Jonathan Glazer, Scarlet Johansson, science fiction, Under the Skin. Bookmark the permalink. Have you seen the recent indie SF film Upstream Color? I highly recommend it if you enjoyed this one… It’s even more surprising perhaps. 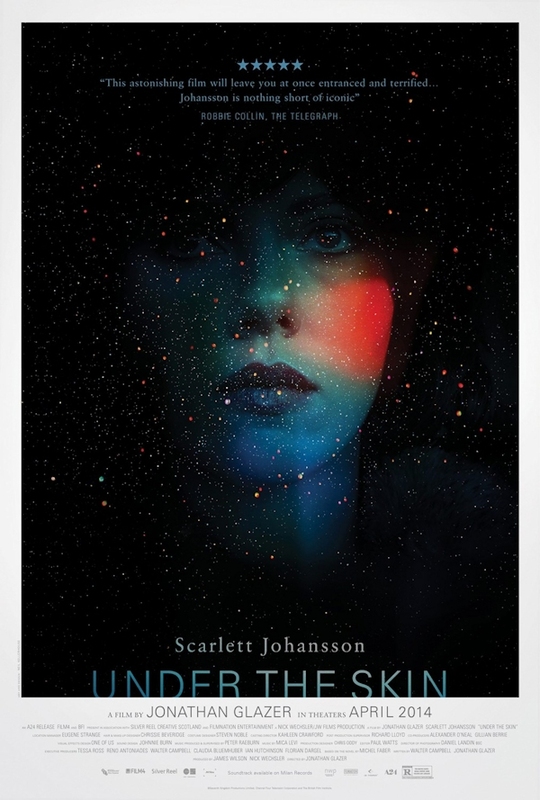 Yes, I’ve seen it, but I didn’t find it even remotely as fascinating as “Under the Skin”. Jonathan Glazer’s movie may be slow and “mood over substance”, but I still had an idea about what was going on. With “Upstream Color”? Not so much. It was too absurd and incomprehensible for me, and I couldn’t find a way into the movie. Thanks for your comment and the recommendation, though :-). Two people caught up in the life cycle of a strange organism. How is that stranger than Under the Skin? First of all, sorry for the late reply; the last two weeks were extremely stressful. Yes, I’m sorry to say, but I found “Upstream Color” to be absurd and incomprehensible. I never found my way into the movie, and for most of the time, hadn’t really any idea what was going on. With “Under the Skin”, I did. Much of it might be implied and open for interpretation, but at least I found enough that allowed me to do exactly that. Mind you, I don’t want to slam “Upstream Color” completely; overall, I liked it. It had some nice ideas, some impressive visuals, and great performances, especially from Amy Seimetz. But – contrary to “Under the Skin” – it just wasn’t my cup of tea.